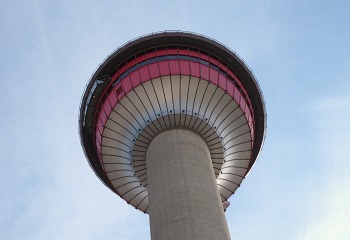 Calgary, Alberta is a young, dynamic city geared towards all season entertainment and activities indoors and out. We're talking oil and cowboys here, and the booming economy and location of the city attract young people and travelers from everywhere. The city is world famous of course for it's Stampede Rodeo, held each summer in July. 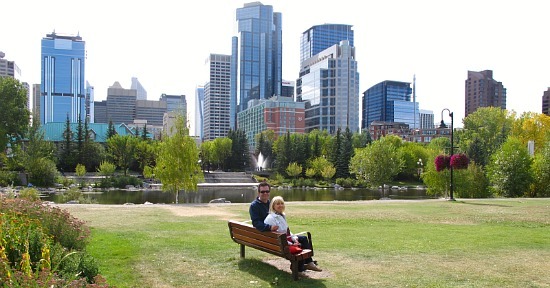 But away from all the crowds, there are many more attractions in Calgary that are ideal for a travel & romance. And only 110 Km's west (70 miles) are the Canadian Rockies, including Banff and fabulous Lake Louise, AB. Here's our ideas for a couples weekend in Calgary, or a romantic getaway in southern Alberta anytime of year. Stephen Ave - most of downtown Calgary is cars and office buildings, which is what makes Stephen Avenue somewhat special. 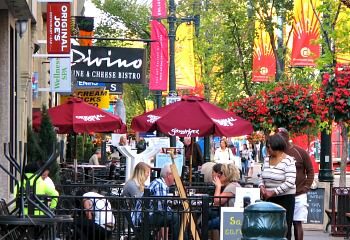 It's the city's only pedestrian mall, a mix of medium/high-end shopping, buskers, sidewalk art, cafes and restaurants with outdoor seating (great in the summer and early autumn). Kensington Village - the hub of Calgary's "counter-culture", a cool look at the un-cowboy side of the city. But what we mostly enjoyed here was eating, and we can heartily recommend Pulcinella (1147 Kensington Cres NW 403-283-1166) for their outstanding pizza and nice comfortable seating outside on the 2nd floor balcony. Bow River Valley - Princes Island Park is accessible by pedestrian bridge, and is a great spot for a romantic picnic in Calgary by the Bow River. More Calgary Attractions for Couples - for fun entertainment, shopping and eating, try the Eau Caire Festival Markets on Barclay Parade SW. Or, if you'd rather see more of Calgary higher up, Sundance Balloons (403-203-9310) offer special anniversary rides & romantic Calgary honeymoon packages. 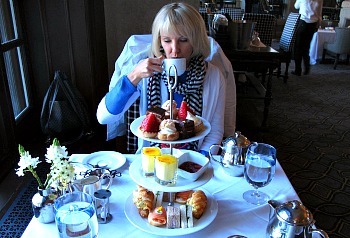 Calgary's Most Romantic Hotels & Inns - see our photos, HD Video and reviews of luxurious places to stay in Calgary for a romantic weekend, honeymoon or anniversary (like the Kensington Riverside Inn and the Hotel Le Germain). Plus, details on romance packages, theme rooms and more. Banff - the distance from Calgary to the Canadian Rockies is only 1 hour by car, so this is a natural spot for daytrips and weekend getaways from Calgary. 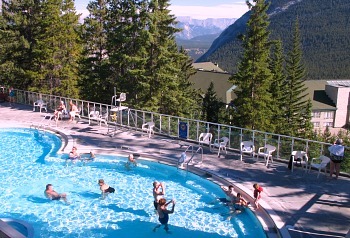 Soak in the soothing mineral waters of Banff Upper Hot Springs. Waterton Lakes National Park is a fabulously scenic spot, and includes fabulous Waterton Lake and the Rocky Mountains in Glacier National Park. There are several romantic Wateron Lakes lodges and inns which would make a fine base for an Alberta honeymoon that's peaceful, secluded, and close to Canadian Rockies hiking and wildlife (we saw a black bear catching fish in a stream!). It's a scenic drive of just 160 miles (265 km) south of Calgary. Weekend Getaway in Canmore, AB - The Georgetown Inn is one of the most romantic small inns between Calgary and Banff. They can arrange all sorts of romantic excursions for couples, including a scenic mountain picnic, hot springs packages and "Secret Spots" adventures off the beaten path. A Romantic Ranch in Southern Alberta - just 38 miles (60 km's) east of Calgary is Strathmore, AB and the Rocking R Guest Ranch. The B&B Cabins have fireplaces and WiFi, and they can arrange romantic outings on horseback, proposal packages, high tea and more. The distance from Calgary Airport to downtown Calgary is about 20 km (12 miles). A taxi ride will cost about $40. Calgary is only about 90 km (55 miles) from Canada's Rocky Mountains. The best way to travel from Calgary to the Rockies is by car. The highway is a wide, 4-lane divided freeway that is easy to drive on. Occasional winter snow storms can cause delays.